Shopping for a new Ford F-150? Most F-150 buyers end up with SuperCrew bodies; we think the Lariat is the best deal, since it’s the least expensive truck with automatic emergency braking (albeit an option). The 2019 Ford F-150 pickup truck proves that the title of “best-selling” doesn’t have to mean “sellout.” The F-150 makes few compromises on its way to excellent towing, comfort, and safety; it’s the best among full-size trucks in those regards. It didn’t choose the luxury-wagon life, but in King Ranch and Limited trim, it pulls it off convincingly. Back with only minor changes for the new model year, the 2019 Ford F-150 sells in XL, XLT, Lariat, King Ranch, Platinum, and Limited trim. Oh, and there's a performance Raptor edition, if you're interested in Baja bounding. The F-150 bears no ill will to aerodynamically smooth machines of the now, but it doesn’t want to be one. It’s a two-box shape and doesn’t fritter away that enduring look with frippy details. The cockpit’s unglamorous in work guise, but cleans up nicely in King Ranch and Limited trim, without losing sight of the job it might need to perform, whether it’s tow rescues or shoe hauls. Few drivers will be left behind by the 2019 F-150's staggering lineup of powertrains. A turbodiesel’s finally arrived, but we’re mixed on its benefits and more sour on its pricetag. Base V-6s serve fleet duty just fine, but the turbo V-6 in most models does V-8 work, thanks to lots of boost and a 10-speed automatic that hits its shift marks with precision. A brawny V-8 gets outpointed by an even brawnier twin-turbo V-6, in 450-horsepower output if you dare. Regular-Cab F-150s aim squarely at fleet buyers, and really, so do the SuperCab trucks with their abbreviated rear bench seats and Honda Element-ish rear-hinged rear doors. The F-150 SuperCrew gets most buyers’ nods, for good reason: it’s expansive inside, and has reclining back seats that fold up or down to boost lockable storage. Beds of 5-foot-6 to 8-foot lengths come on various cab styles; if you’re carrying lots of people and lots of drywall, something’s got to give. Regardless of trim, save maybe for base XLs, the F-150 has better fit and finish than many of Ford’s small sedans and SUVs, and in top trims, better than many Lincolns. Safety scores have been strong, but Ford limits automatic emergency braking to the more expensive F-150s, which it shouldn't do. 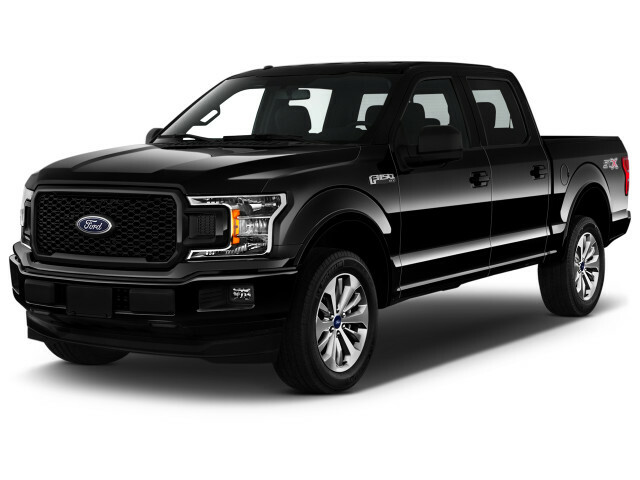 Other features vary hugely, depending on the F-150’s trim level and purpose: you can have an F-150 XL with a washout-ready cab and a big front bench seat and roll-up windows, or you can trim a Limited with active lane control, Bang & Olufsen audio, navigation, in-car Wi-Fi, and 22-inch wheels. The details may change, but Ford recognizes the F-150’s powerfully simple form for what it is: two boxes, hold the extras. GM’s trucks have gone Transformer on us, while the Ram’s lost its Freightliner appeal. The Ford F-150 endures, with a substantial look that doesn’t riff through the French curves like the F-150s of the last century did. If there’s a straight line missed in the F-150’s styling toolkit, we’re not aware of it. The horizon looms large everywhere on the F-150, across its various grille designs, in the headlights, down the body sides and across its expansive tailgate. Sport packages can graft on a honeycombed grille, and King Ranch and Limited trucks slather on the chrome, but there’s precious little to call out the F-150 as anything but a pickup truck—or to disrupt the smooth flow of air down its aerodynamically contentious body. If you need to tell one F-150 from another, look at the trim and the tailgates. Black-plastic trucks are work-spec, mostly, while the heavy bright finishes of the high-end trucks are obvious. Lariats wear a huge F-150 stamped into the tailgate, while other models sport a metallic brushed inset. Inside, the F-150 cockpit evolves quickly from its utilitarian roots. F-150 XL fleet-spec pickups have a plain dash and wear easy-to-clean materials, but from the Lariat on up, the F-150’s chunky dash can sprout big consoles, big touchscreens, LCD screens inside its gauges, leather, and wood. The unfussy cabin has controls sized for big gloved hands, and dials remain where other vehicles have merged functions into touchscreen systems. We’re especially fond of the King Ranch editions and their wild western-themed garb, but most trims from XLT on up have a good level of finish and an uncluttered, efficiently organized workspace. V-6 and V-8 engines, 6- and 10-speed automatics, rear- and four-wheel drive: the 2019 Ford F-150 blends all the performance it needs with exceptional towing and hauling ability. It’s a made-to-fit work truck that has a fairly smooth on-pavement ride and reasonably sharp handling. Last year the F-150 gained a new 3.3-liter V-6 base engine. Power grew versus the former 3.5-liter, to 290 hp and 265 lb-ft of torque. The new engine has direct injection for better fuel economy, but carries on with the only 6-speed automatic in the big Ford truck family. It’s fine; as a work-spec and fleet truck, the F-150 in this configuration is no penalty box. It’s relatively quiet under strong acceleration, and has good low-end torque that couples well with the 6-speed automatic. It doesn’t strain much to deliver the efficient power it needs for its lighter-duty ratings. Most retail buyers will end up with the 2.7-liter turbocharged V-6. With 325 hp and 400 lb-ft, it’s hooked to a 10-speed automatic and essentially replaces the V-8s Ford used to equip in its mid-line trucks. An option on XLT and Lariat trims, the turbo V-6 has strong low-end torque that issues forth in linear fashion, lump-free and smooth. The tow ratings are worth the price of admission alone: so equipped, the F-150 can pull 8,500 pounds or tote 2,500 pounds in the bed. It’s the entry point for the 10-speed automatic. Ford’s application (it developed the gearbox with GM) has smart and quick downshifts and effortless upshifts that allow it to change up to five gears at a time. It doesn’t really relax into its top two gears until it’s been cruising at higher speeds for a long time, but uses all those lower gears to deliver lower-numerical rear axle ratios for better gas (and diesel) mileage without denting tow capability. If there’s no substitute for the throaty rumble of a V-8, Ford has a 5.0-liter engine for you. It’s more a pride thing, really, since the V-8’s outrated in its own family. It does thrump out 395 hp and 400 lb-ft, and couples to a 10-speed automatic to help it wring out more miles between pump visits. Classic soundtrack set aside, the V-8’s simply outclassed by Ford’s own twin-turbo 3.5-liter V-6. It throws off 375 hp and 470 lb-ft in most versions, but in the Limited and Ford F-150 Raptor, it’s tuned to 450 hp and 510 lb-ft of torque. 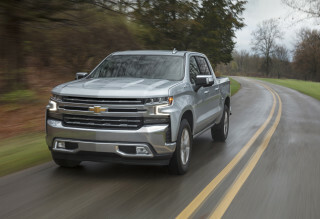 Its throbby exhaust turns to an angry whistle after it launches the two-tons-plus truck into the atmosphere, and can tow up to 12,000 pounds thanks to the low-end torque delivered by its smartly staged turbochargers. Fuel economy can jump wildly if it’s used on highway slogs or if it rips away from every stoplight, but the effortlessly strong power makes it all better. It’s made all the better by the fluid, instant shifts programmed into the 10-speed. All F-150s sport electric power steering and a version of a coil-and-shock front end with a Hotchkiss-type solid rear axle on leaf springs and outboard shock absorbers that are staggered to reduce axle windup. None of the fancy adaptive shocks of the Expedition, or the air-spring setup of the Ram 1500. The suspension makes for an even-keeled setup at low to moderate speeds, where the F-150 can cruise with the ride isolation and smooth motions of a mid-size sedan. Amp up the speed or throw in some bumps, and an unladen F-150 can pitches and bounds and rolls exactly as you’d expect a big truck to behave. Ford’s tuned the electric steering to anticipate, and it can steer to counter crosswinds when a trailer is towed, but the suspension tune isn’t as composed as some rivals: likely, it’s not as easy to damp the lighter-weight body as Ford may have hoped. Of course, none of that holds a candle to the performance wild child of the F-150 lineup, the Ford Raptor. If you’re interested in Baja running and border patrolling, read MotorAuthority’s first drive review of the Raptor. The F-150 modulates its truckish ride and brute-force utility with smartly outfitted bed systems and luxury-lined cabins, but the two don’t always combine in the same truck. On our ratings scale, the vast F-150 lineup is all over the map. We give the F-150 a point for its exceptional cargo capability. Some models would get an extra point for very comfortable seats, while others would lose a point for cramped rear jump seats. Ford sells the F-150 with a choice of cabs. There’s a two-door Regular cab, and an extended SuperCab with rear-hinged doors and a short back seat. The four-door SuperCrew F-150 sells the best, and for good reason, we think. The wash-and-wear F-150 Regular Cab usually comes in XL or XLT trim, which is shorthand for work truck. The spartan cabin usually has front bench or wide bucket seats split by a huge console. There’s plenty of head and leg room, but not much in the way of creature comforts–if you’ve missed wind-up windows, here’s your chance to reacquaint. SuperCab trucks sport rear-hinged doors that grant access to the back seat, which is a slim-line setup that’s meant as very short-distance seating for two smaller passengers. It’s better off folded down, where it serves as a makeshift work bench, or folded up and out of the way for better storage. The F-150 SuperCrew is the most popular configuration, and it’s amply sized in every direction. It has four full-sized, front-hinged doors, and can hold up to five adults in very good comfort. In top King Ranch and Limited trim, the front seats have multi-contour adjustment, heating, and cooling, features more in line with Lincoln than with rugged truck duty. It’s all but an SUV replacement, with vast amounts of rear-seat space and reclining seat backs. The rear seats also fold up against the bed wall as they do in the SuperCab, which grants even more lockable storage space; it’s paired with under-seat cargo cubbies that hide expensive power tools and laptops, and a deep and wide front-center console that has room for laptops, tools, even hanging files. The F-150 cabin’s replete with lots of cupholders and enough USB ports to charge a fleet of tablets and smartphones, not to mention standard 110-volt outlets that can recharge small appliances and tools. The center controls have big knobs and buttons for easy use, and most key work functions, such as trailer assist, have hard controls outside the big-screen infotainment system. The F-150’s bed has its own extraordinary talents. It’s offered in 8-foot, 6-foot-6, and 5-foot-6 lengths, depending on the model. In-bed loading ramps, interior bed lighting, and cleats and brackets are available from the factory and are helpful for loading and securing gear in the truck. The long-bed styles offer long-range 36-gallon fuel tanks for extreme-distance drives. The Ford F-150 is mostly quiet inside, although we haven’t had any experience in XL models without acoustic glass. Noise cancellation piped into turbo-6 models helps quell some unnerving noises from the V-6 engines. Fit and finish ranges from the workmanlike vinyl and plastic in base trucks–it’s made that way for durability–to plush and finely textured, like the untreated baseball-glove leather found in King Ranch editions. First, the scores. The NHTSA awards the latest F-150 five stars overall, and in most subtests except rollover resistance, where it earns four stars. Those excellent federal scores are backed up by the IIHS’ “Good” nod in almost all categories, save for a “Poor” headlight rating. The IIHS scores may change as the agency begins to rate passenger-side small-overlap protection. The F-150 comes with many safety features, but leaves most on the options list. An F-150 cannot be ordered with forward-collision warnings and automatic emergency braking, blind-spot monitors, adaptive cruise control, active lane control, and inflatable rear seat belts until buyers reach the Lariat trim level or higher. Ford’s omissions aren’t the only ones in the pickup class. At the very least, forward-collision warnings and automatic emergency braking should be available on all models and standard on more than just the Limited trim. Ford’s active lane control system needs to be improved, too. In our driving experience, the system causes the truck to pinball within its lane, and it confuses road seams with lane stripes. Ford boasts that millions of F-150s can be configured from its palette of powertrains, cab styles, bed lengths, and trim levels. It’s no joke: a trip through the online configurator can take hours, if you’re persnickety with details. The trim lineup includes XL, XLT, Lariat, King Ranch, Platinum, Limited, and Raptor editions. The features found on F-150s break down broadly, though, into three kinds of trucks: one for work, one for play, one for show. Basic work trucks are no-frills affairs but can be customized in hundreds of ways, for example. All F-150s have that built into their hardware, and they also have a plethora of infotainment and luxury touches. The Ford F-150 XL and XLT have the basics handled. They can be configured with any cab style (Regular Cab, SuperCab, and SuperCrew) and every bed length (5-foot-6, 6-foot-6, and 8-foot). Nearly every drivetrain can be specified in them, as well. On all XL trucks, Ford stocks manual windows, an AM/FM radio, manual door locks, vinyl floors, a tilt/telescoping wheel, air conditioning, and on four-door models, flip-up rear seats. Equipment packages add on trailer hitches, cruise control, and power accessories. On the XLT, Ford antes up with power locks and windows, cloth front seats, chrome bumpers, and a CD player. The XLT’s more of a blank canvas for retail buyers: it can be equipped with 18-inch wheels, a sport-appearance package, an off-road package with skid plates and special shocks and four-wheel drive, and a trailer-assist feature that makes hitching as easy as the turn of a knob. The XLT also can be fitted with navigation, power seats and power-adjustable pedals, and blind-spot monitors. It’s our pick for the truck driver that doesn’t need a lot, but requires more than the utility trucks bought for municipalities. Lariat F-150s only come with turbo V-6 engines or V-8s, and only with four doors. They get an 8.0-inch touchscreen with Ford’s Sync3 infotainment system and keyless ignition standard, along with XLT goods. Options include premium Sony audio, adaptive cruise control, automatic parking assistance, heated front and rear seats, and two-tone paint. On the F-150 King Ranch, Ford ventures into dude-ranch territory with saddle-colored leather, heated front and rear seats, lots of chrome trim, and multi-contour power front seats. 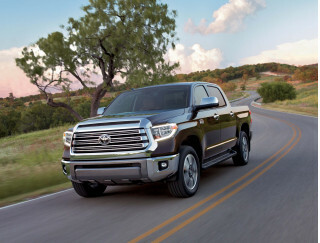 Options run the gamut of luxury, from a surround-view camera system, to active lane control, blind-spot monitors, power running boards, a bed extended, a moonroof, a trailer-tow package, and 20-inch wheels. For the Platinum F-150, Ford loads on blind-spot monitors, remote start, ambient lighting, inflatable rear seatbelts, navigation, wood trim, and heated and cooled front seats, as well as LED headlights. At the top of the F-150 performance lineup, the F-150 Raptor tightens the screws on Ford’s twin-turbo V-6. 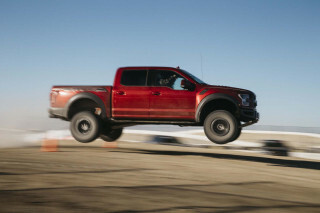 Raptors make 450 hp from the powerplant (available this year in the F-150 Limited, too) and bundles it with six drive modes, exceptional ground clearance, and special knobby off-road tires. It’s essentially a desert muscle car with a pickup bed on the bad, and it’s dearly expensive. F-150s in general are pricey trucks these days. Base vehicles begin in the high $20,000 range, and it’s easy to get a mid-range F-150 above $50,000–never mind the $80,000 or more possible on the top-end pickups. With aluminum body panels and 10-speed automatic transmissions on most version, the Ford F-150 posts competitive fuel economy figures. Its new turbodiesel engine doesn’t move the needle as much as hoped, though. EPA figures haven’t been published for 2019 yet, but we expect the 2018 ratings to carry over. Those numbers put the turbocharged 2.7-liter V-6 F-150 at the top of the gas-mileage ranks, at 20 mpg city, 26 highway, 22 combined. Last year a 3.3-liter V-6 replaced Ford’s older 3.5-liter design, but it’s still coupled with an older 6-speed automatic. This fleet truck carries ratings of 19/25/22 mpg (for rear-drive models). 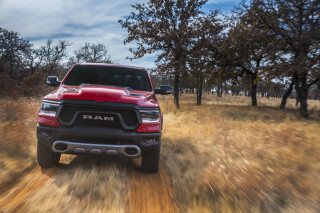 The new 3.0-liter turbodiesel V-6 carries EPA ratings of 22/30/25 mpg with rear-wheel drive, and 20/25/22 mpg when equipped with four-wheel drive. The latter ratings aren’t much better than the F-150’s top gas-powered engine–and with the turbodiesel, tow ratings actually drop, as much as a couple thousand pounds. 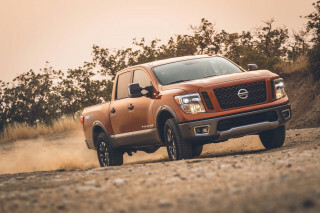 In F-150s with the 3.5-liter twin-turbo V-6 and a 10-speed automatic, EPA ratings have held at 17/23/19 mpg with four-wheel drive. A step up into V-8 range nets 17/23/19 mpg with rear-wheel drive, 16/22/18 mpg with four-wheel drive. Ford plans to add a hybrid F-150 in the next couple of years.